This two vehicle car crash occurred at approximately 1:00 a.m. on Ashgrove Road (Ky. 1980) about five miles north of Nicholasville, Kentucky. Reports indicate that a 2001 Ford Taurus, driven by 19 year old Mackenzie Sayre was traveling eastbound when it lost control and struck a 2010 Nissan, which was traveling westbound. 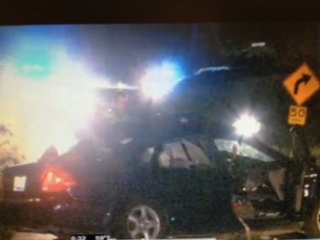 Ms. Sayre died at UK hospital from injuries she sustained in the crash. A passenger in Ms. Sayre’s car, 19 year old Sarah Smith was injured, taken to the hospital, and is still in critical condition. The driver of the Nissan, 20 year old Britney L. Kennedy, was taken to the hospital, treated and released. Accident re-constructionists are still piecing together what happened. Various reports indicate that multiple parties stopped and assisted the injured women. Under Kentucky law, persons injured in motor vehicle accidents can seek civil legal compensation for the injuries they have received and the legal damages suffered related that relate to an accident caused by the negligence of another. Such damages that are legally compensable include reimbursement of medical bills, both what has been incurred and any estimated future medical bills tat may be incurred, lost wages due to missed work related to the accident, and pain and suffering damages. In an accident like he one herein reported, Ms. Smith and Ms. Kennedy will have both suffered injuries and incurred medical bills. They both will have Kentucky Personal Injury Claims related to this terrible accident. Under Kentucky automobile insurance law, both Ms. Smith and Ms. Kennedy should be afforded PIP coverage which should be about $10,000.00 in coverage. These insurance monies can be used to pay medical bills, but are also available to immediately compensate injured persons for lost wages they may incur due to their injuries and missed work. Often, if a person is severely injured, they should affirmatively state to their insurance company not to pay any PIP monies until such time that the injuries are fully realized and it is determined how much income has been lost due to missed work. Injured persons can reserve their PIP coverage and have lost wages paid quickly before medical bills. This is important for persons on a fixed income where rent or other important bills have to be paid even though work is missed due to the injuries. Information about the rights of persons injured in Kentucky Auto Accidents can be found at the Ackerson Law Office’s website and legal blog. (Link to Ackerson Law Office’s Site).